Summer 2001, and Nintendo does what only it can – looks backwards and forwards at the same time. While Nintendo’s handheld gaming legacy was being passed to the new Game Boy Advance, on the Game Boy Color Nintendo and Capcom were delivering not one but two entries in The Legend of Zelda series. The Legend of Zelda: Oracles of Ages and The Legend of Zelda: Oracle of Seasons were the kind of twin releases that only Nintendo would attempt. Eight years had passed since classic adventure Link’s Awakening in 1993. The Game Boy format was showing its age, especially compared with its own 32-bit successor, the Game Boy Advance. Design duties on the Oracles were handled not by Nintendo but by Capcom’s Flagship, and production was troubled, with initial efforts to remake the original Zelda and then create a trilogy of games proving too challenging. 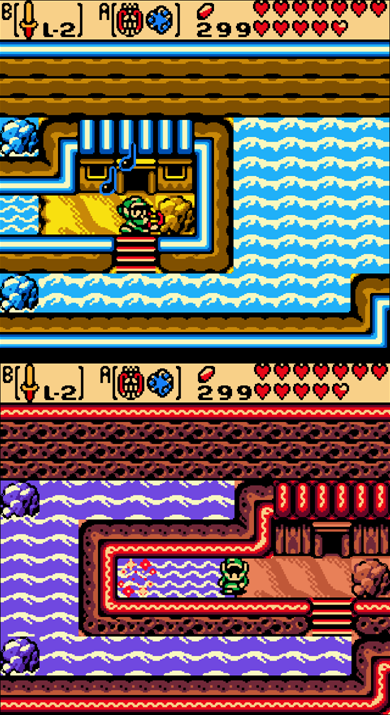 Yet Capcom crafted an ambitious Zelda adventure in two-parts as the Game Boy Color’s swan song. Both Oracle games stick close to the template laid out in 1993, with central hub villages of colorful characters, and expansive top-down worlds that stretch across deserts, prairie, and mountain ranges, all upgraded in 8-bit color! Two Zeldas, two different games. Oracle of Ages presents the tougher challenge, in part due to the time travel gameplay mechanic. Link can warp between past and present using the Harp of Ages – a design hook that harks back to Ocarina of Time. But if you think you’ve played it all before – the dungeon-crawling, the items and upgrades, the nutty characters, side quests and secrets – then Oracle of Ages contains a few surprises. Capcom takes full advantage of time-traveling puzzles – actions taken in Labrynna’s past have an impact hundreds of years in the future. 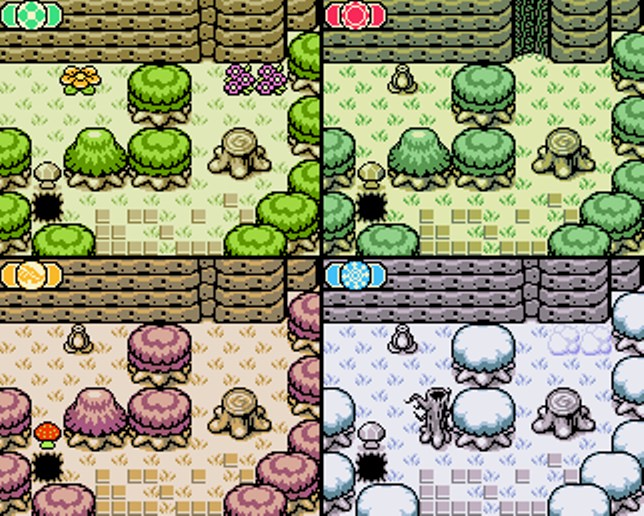 Oracle of Ages tests the player to think in four dimensions – even hiking across the game world can be difficult when faced with landscapes that change over time. Continental drift – travel back in time and this island shifts from west to east, effectively creating a new path in The Legend of Zelda: Oracle of Ages. Remember the Water Temple? Like Ocarina of Time’s infamous dungeon, here Jabu-Jabu’s Belly spikes the difficulty. Raising and lowering water levels is hard enough when rendered in three dimensions, but in the 2D Jabu-Jabu’s Belly things get tricky when holding in mind locations above and below – as well as areas beneath the water’s surface. After being gently guided through the recent Twilight Princess and Skyward Sword, Oracle of Ages jolts the player with its unforgiving challenge. And then there’s Nintendo’s trademark sense of fun – see the clever trading sequence in which Link gives a present-day vase to a Goron in the past, who in turn hands down the vase as a heirloom to his descendants, to be caught-up with Link again in the present. This Zelda even plays with time travel paradoxes! More so than in Seasons, character and story play a deeper role in Ages. A greater focus on the tragic inhabitants, and their struggle with the effects of Veran’s meddling in their timeline, keeps the player invested in the land of Labrynna. Brisker and breezier, Oracle of Seasons features fewer puzzles and more action. Dungeons pose less of a challenge: many can be cleared in one playthrough. Even navigating the world of Holodrum is more straightforward. Here the seasons have been thrown out of order by General Onox, and Link must use the Rod of Seasons to cycle through spring, summer, fall, and winter to access new areas, solve puzzles, and save the oracle Din. The shifting seasons reveal secrets and pathways – lakes freeze over and snowdrifts pile up in winter, while in summertime dry riverbeds can be easily explored and vines provide a way to shimmy up cliffs. And Oracle of Seasons has only one world to contend with (plus the cute underground section of Subrosia) compared to Oracle of Ages’ two eras – time travel can be disorienting, whereas flipping between the seasons is light and fun. Thinking spatially then comes more easily than thinking temporally. Like their predecessor Link’s Awakening, Oracle of Ages and Oracle of Seasons perfect the balance of overworld exploration and dungeon crawling. Both are technically excellent pocket-sized adventures that complement each other, and the Zelda series as a whole. While the Game Boy may have been aging, it was remarkable how well the old Link’s Awakening engine stood up in 2001 (and 2015). To receive two superb handheld Zelda games at the end of the Game Boy’s life, eight years after the classic Links’ Awakening, was an unexpected gift. The Legend of Zelda: Oracle of Ages and The Legend of Zelda: Oracle of Seasons have been rereleased on 3DS Virtual Console. I have Oracle of Ages as a virtual console game on my 3ds but i still haven’t beat it yet. The older games are so much more challenging than the new ones nowadays. I had both games back in the day. Nearly beat Oracle of Seasons but got stuck at fighting Onox in his dragon form. I hated Ages, getting into Jabu-Jabu was stupidly convoluted! I got to the final boss and quit. Don’t think I have beaten it yet. Is Seasons better then? Sounds it. The whole Jabu-Jabu section was pretty difficult, and Ages is the tougher game overall, based on puzzles. I admit I enjoyed Seasons more because it was lighter, quicker – I didn’t feel like I got bogged down with the puzzles.